Since the weather has slowed down a bit, we'll cover some non-weather topics the next couple of days. Sound science produces predictions that come true. The science behind climate change does not. Indeed, the experts have been proven wrong time and time again. Around the time of the first Earth Day, scientists were predicting a coming ice age. Then, as global average temperatures rose in the 1980’s, global warming became the big threat. Al Gore in 2005 predicted that the polar ice caps would be gone by 2015, leading to a catastrophic rise in sea levels. But in 2015, the polar ice caps were not gone. NYC's westside highway was supposed to have been perennially underwater long ago. Forecasts are changed on the sly. Of those forecasts that were not changed, there is zero acknowledgement of the errors. Except it isn't true. There is a temporary blip because of the El Nino (circled, below). 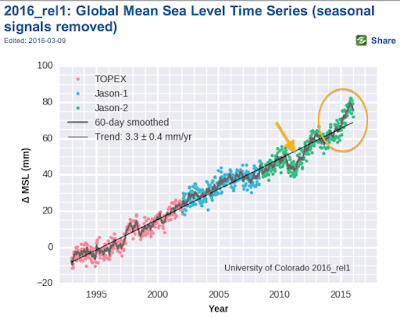 Calling the blip "faster than at any time in the last 2,800 years" is no more valid than citing the down blip (arrow) and calling it, "Sea levels are falling!" None of this nonsense bears the slightest resemblance to science. Disputing specific sea level rise predictions is one thing. Attempting to create the illusion of reasonable doubt surrounding the physical fact that our greenhouse gas emissions are warming the global climate is irresponsible bs. No matter what Al Gore or Time Magazine or Newsweek are alleged to have claimed.